Arthur’s Day™ 2013 is just around the corner! There will be another wave of party coming up in September! In Arthur's Day Celebration this year, they will be bringing Five for Fighting, All American Rejects and The Wanted over for the party! There's a pre-heat mini Arthur's Day happened in Soho Free House last Saturday. Like what happened everytime, we bloggers are invited over to the party as media. A few pints of Guinness Stout are waiting for us! The people who attended that night were also given a chance to vote for their favourite artist for the official Arthur's Day Party. 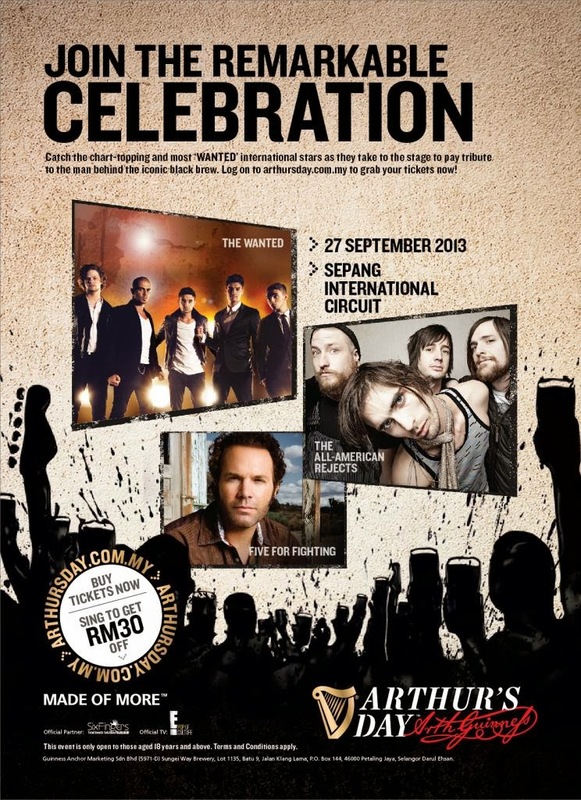 And we might have a chance to see them in Penang! First make a 3/4 pump, let it flow through the side of the glass. Leave it on the table and watch the magic happens! After 1 minute, make the final pump and let it down for a while again, there goes a perfect Pint of Guinness! There are more mini parties around, so you don't want to miss them! 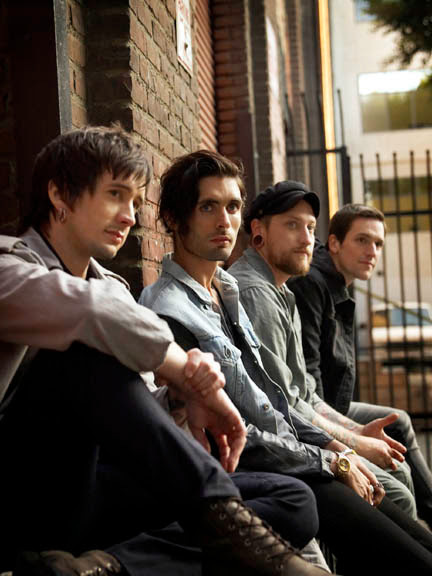 Here are some quotes from the artists that going to perform on Arthur's Day. What are you waiting for? 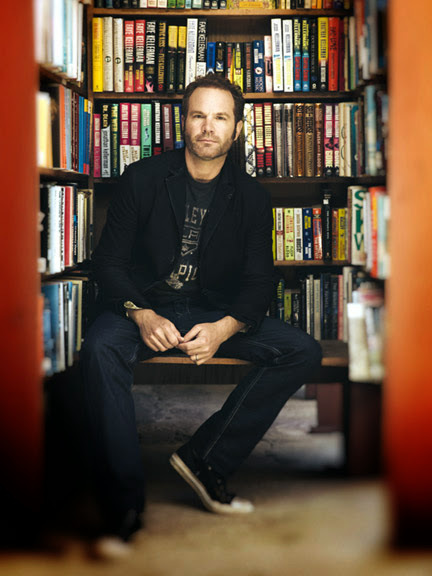 Get the tickets now! Just go to http://www.arthursday.com.my and make your purchase! 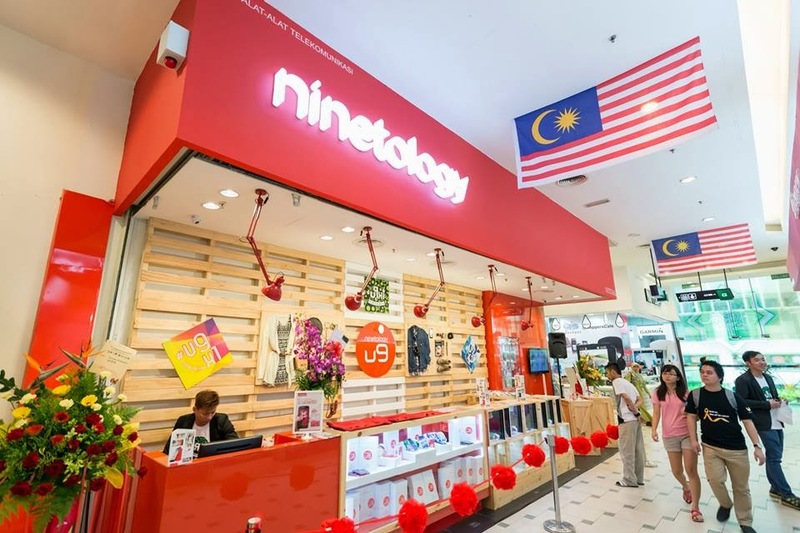 Ninetology, The Next Trend In Malaysia! 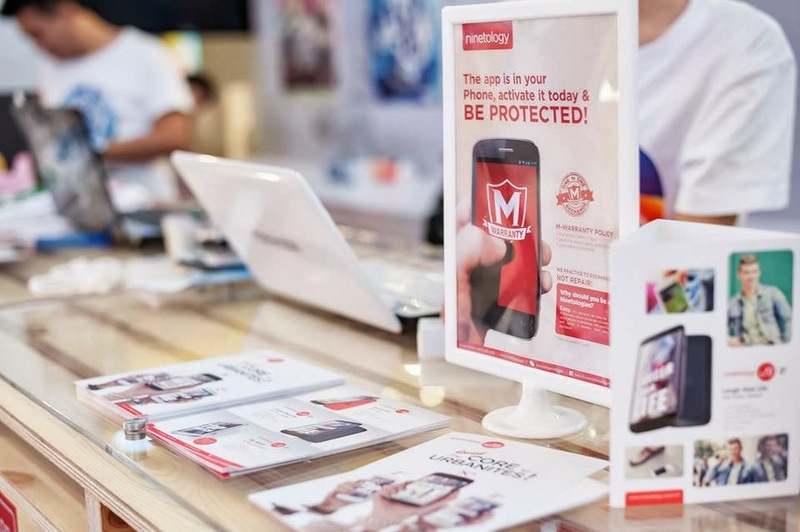 Ninetology Malaysia had officially launched its Flagship Touch Point at Plaza Low Yat on 30th of August. Plaza Low Yat is Malaysia’s Largest IT Lifestyle Mall. In this Ninetology Flagship Touch Point, you will be able to see all Ninetology products, and at the same time, you will be able to learn how to use a smartphone to enhance your life to make your life easier. 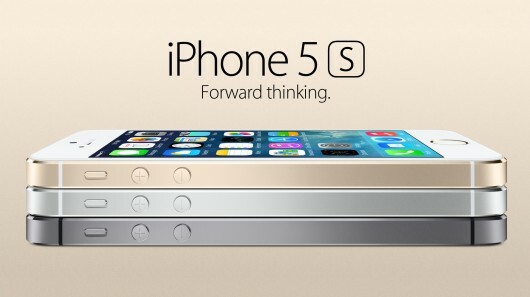 Thus, have more interactions with your friends and family without paying more with smart phones. 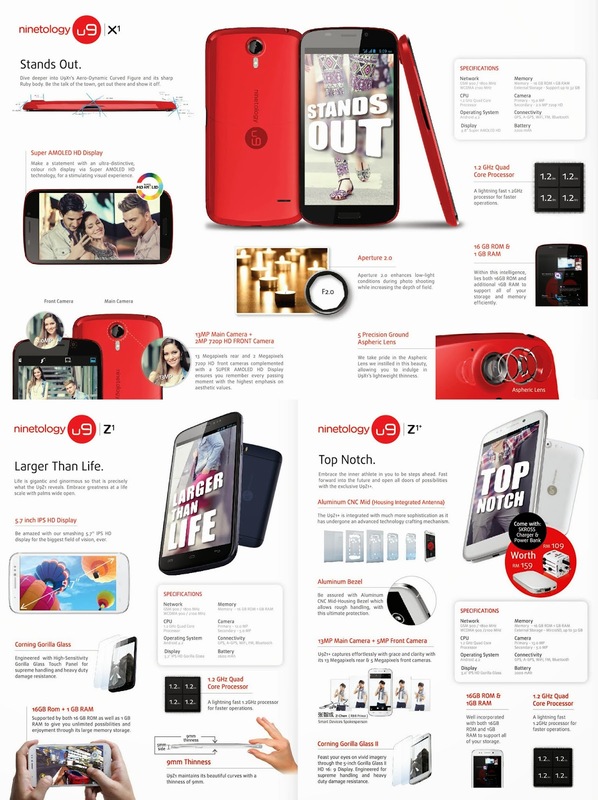 This Flagship Touch Point looks so nice isn't it? And it is just near the entrance, can be easily seen. The red ribbons are also ready for the opening ceremony. There were artistes, founders and other related people attended the launching event and ribbon cutting ceremony. 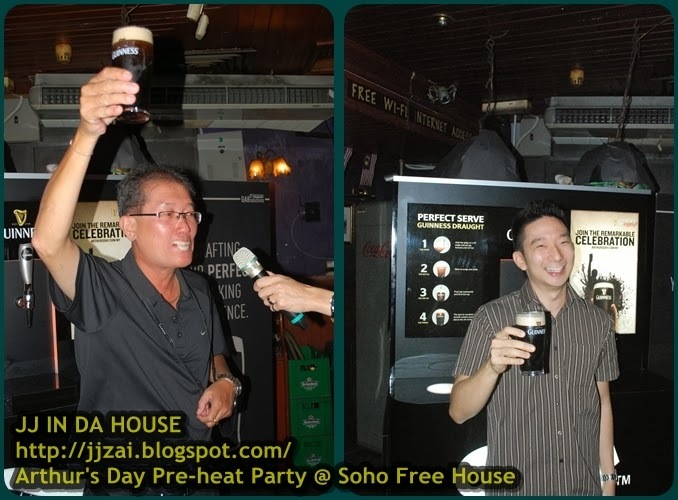 Sean Ng (Chief Executive Officer), Marco Beh (Chief Operations Officer), Shian (Chief Finance Officer), Vijian Chan (Chief Marketing Officer), and Eddy Tay (Head of Channel); Michael Lee (General Manager, Property Management and Operations of Plaza Low Yat), and celebrities such as Z-Chen, Iqwal Hafiz, and Sasi the Don. 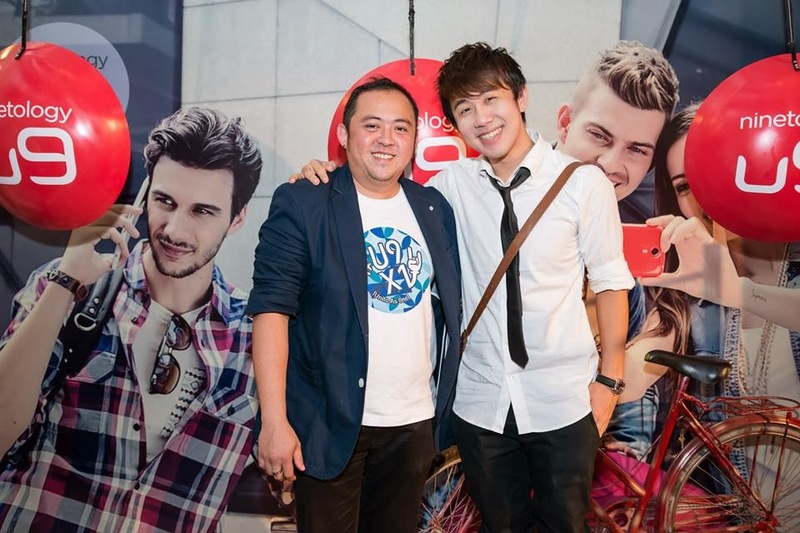 Mr. Vijian Chan, CMO of Ninetology, & Joseph Germani was there too!!! Well, events nowadays are full with photoshoot opportunities, I would pose and snap together with the bicycle though. 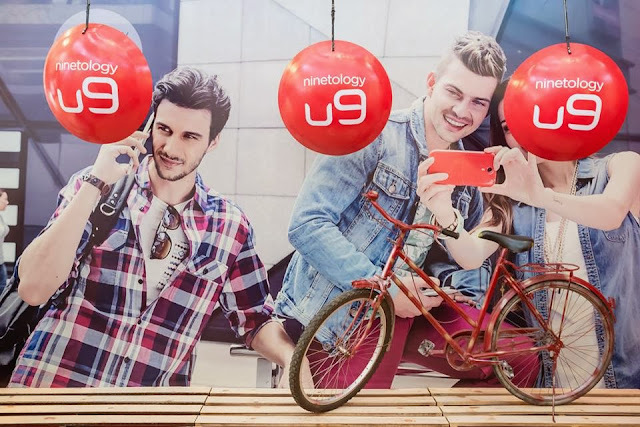 On the other hand, Ninetology Malaysia had also launched their U9 series at KL Hilton Hotel, Malaysia, earlier last month. The “Unite-as-One” power-infused technology with the urbanite profile was presented in three models: The X1, Z1, and Z1+, they are stylist, modern and very elegant! Ninetology U9 will be the next new trend of Ninetology and Malaysia's smartphone industries, you just gotta try it to know how it is compare with other smartphones. Below are a few videos introducing Ninetology to you! Let's Z-Chen introduce you to Ninetology U9! The previous post was about food review at 32 at The Mansion. 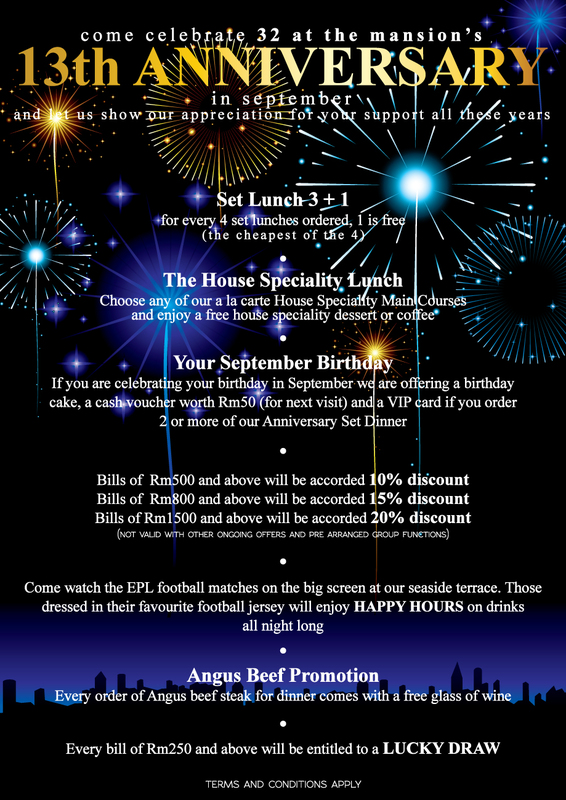 They have come out with some special promotions only for September! In my previous post I reviewed about their Angus Beef set and it is now on promotion too! Now you have more excuse to dine at 32 at The Mansion. The promotion is only for month of September only, don't be late! It is time to give you love ones a romantic dinner! Reminder: Make reservations earlier to make sure that they have tables available for your chosen night. Address: 32, Jalan Sultan Ahmad Shah, 10050 Penang, Malaysia. This is my very first time having food review for fine dining restaurant. This experience was very extraordinary and impressive. Even from the exterior of the building was already looks kinda grand and spectacular. They have also obtained good ratings at Tripadvisor. ThreeSixty Sky Bar is also part of their business. This place is so beautiful that when you walk into the mansion, you will feel like you are entering some high class places. Catering or private party and events are also available in 32 at The Mansion, this place can caters up to 200 people. Actually you can choose to dine in the mansion, or you may also dine at Beach Blanket Babylon, if you prefer outdoor and some nice seaview. This is what they have in their bar, I wish I could have this at home. We were served with some delicious food, inclusive of appetizer and main course, ended with some perfect desserts. This salad was really appetizing! The salad was very fresh and the dressing has totally conquered my taste bud! The taste of lemongrass wasn't too heavy and the whole dressing was rather unique, it was slightly spicy and sour which is a great appetizer to kick start your dinner. Laksa lemak is not so common in Penang as majority of Penang people prefer Asam Laksa than Laksa Lemak. I'm someone who love Laska Lemak and therefore this dish has made my night quite perfect! Though I didn't see any crab meat, but the taste of the soup was really filled with fresh crab taste and it wasn't too spicy or sour. The soup wasn't really watery, just like drinking curry soup. Everything was just perfect when lime and prawn sauce added! This is the fish version of Laksa Lemak, the soup of Fish Laksa Lemak was more watery compared to Crab Laksa Lemak. Not forgot to mention that the laksa noodles was really chewy. Unlike some laksa noodle which can be too soft or too hard. The taste of the whole laksa was really perfect if you squeeze all the lime and add their special made prawn sauce into the soup. This beef noodle was served with raw bean sprouts, so do remember to add those bean sprouts when the soup is still hot. There are juicy beef meatballs and beef slices in this dish. Their special made chilli sauce was really delicious and appetizing as it is not too spicy plus it was a bit sour. Chicken thigh was used in this dish, it was rather tender and juicy. It may looks a bit over grilled but I can tell you that it is not. It was really grilled to perfection that the whole piece of chicken was really tasty. The buttered rice was also quite unique and delicious, especially when you can have it together with baby carrots. From the look of the dish was really making people hungry. The beef rib was really soft and tender. The slow cooked potato was also one of the plus point in this dish. It also went perfectly with ginger bud puree because the puree was really unique and delicious! If you are a lamb lover, you will definitely fall in love with this dish! The lamb was really soft, you don't have to chew and chew and chew before you can swallow the lamb. It was really good when it topped with the sauce. The side dishes was sweet potato and roasted garlic puree is also one of the plus point in this dish as it was really smooth that I would want to order a whole bowl of only the puree! There were also braised portobello mushroom with goat feta cheese, preserved zucchini and torch ginger which made this dish rather perfect and complete. There are Angus Beef promotion which running currently in 32 at The Mansion. You can select from Sirloin, Ribeye or Tenderloin, pricing start from RM85 ++ There are also 3 choices of sauce which are Black Pepper Sauce, Perigeaux Sauce or Mushroom Sauce. The Angus Beef is served with served with potato and thyme puree, together with mixed vegetables. This is the manager and the chef, Mathijs Nanne that came from Holland, who prepared all our food. We had a little bit of chit chat with them and get to know more about all the dishes that they prepared. Lastly, something that you must not miss when you come to 32 at The Mansion! It was one of the best ice cream I have ever had in my life! It tasted like chendol, just without the green chendol jelly. Not forget to mention that all their ice cream were prepared by the chef himself. The whole toffee pudding will melt inside your mouth. It is served with macerated strawberries served and vanilla bean ice cream, which was also prepared by the chef himself. This is also one of the best dessert I have ever had. This is something that will make you come back for it! This dessert was a piece of cake of the day, and it served with caramelized apple and guava, marinated raspberry and sour cream ice cream. It may be too sweet if it is just the cake, but it was perfect when you have it together with sour cream ice cream. Not forget to mention that the other side desserts was really unique and tasty. This ice cream was also prepared by the chef himself. Sour cream ice cream is not so common in Penang too, this was my first time trying this flavour of ice cream too. It was sour but creamy, tasted rather special and it will be good if you don't really like your desserts to be too sweet. This is one of the best food reviews so far. I will definitely go back to this 32 at The Mansion again for their food. I really wish to try other desserts and main course as well. Do remember to bring your love ones with you.